Dundee manager Barry Smith paid tribute to veteran goalkeeper Rab Douglas following the 2-0 loss at Celtic. 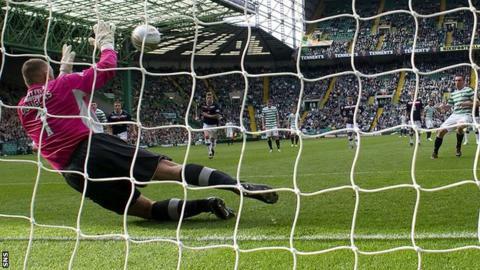 The 40-year-old stopped a penalty and made a series of other fine saves against his former club. "Rab has done extremely well for us all season," said Smith, who is dealing with a long injury list. "At 40 years of age, producing performances week in, week out is difficult and for him to continue to do that is great for or club." Strikes from Gary Hooper and Victor Wanyama gave Celtic maximum points but the victory would have been more comprehensive had it not been for Douglas and some poor finishing. Douglas brilliantly saved a Scott Brown penalty in the 38th minute - only to be beaten just before the break when Hooper hammered in from 10 yards. Wanyama fired in from distance after four minutes of the second half and after that the home side were in complete control but continued to spurn numerous opportunities. Smith claimed his side might have been denied a first-half penalty when defender Gary Irvine went to ground after going past Emilio Izaguirre. The former Celtic defender said: "I think that Gary Irvine was possibly tripped going into the box. "I haven't seen it but I think it would be strange for him to go into the box and go down as easily as he did. Gary said he was clipped but I can't say anything until I see it for myself." Smith mourned John Baird's missed chance from 12 yards when the game was goalless, while Colin Nish also wasted a good opportunity. He said: "If we take the chance then it is a different game. Chances don't come that often at Celtic Park so you have to take them. "Obviously when Robert makes the penalty save, you think maybe something will turn again but unfortunately for us it didn't. "We're not kidding ourselves; Celtic were the better team. "But the boys stuck to the task. It would have been easy to buckle at 2-0 down early in the second half."